When people experience pain in their chest, they tend to automatically think the worst — that they may be having a heart attack. 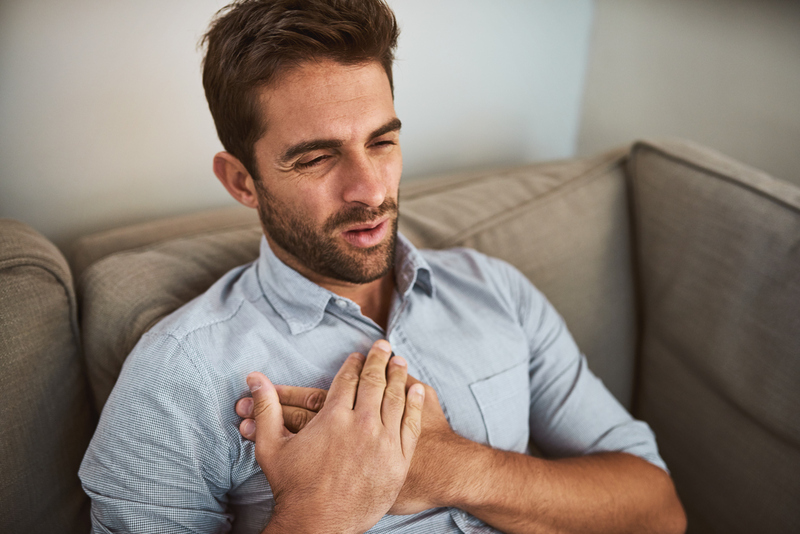 Although it’s true that chest pain on your left side can be a warning sign of a heart attack, it’s pretty safe to assume that chest pain that occurs on the right side has nothing to do with your heart. And it’s these other structures that are most likely the source of right-sided chest pain. And this is also true if the chest pain is accompanied by pain in the upper right side of your back or right shoulder. That said, if you are currently experiencing severe chest pain, you should seek medical attention and consult your doctor for medical advice to rule out a life-threatening condition. As I mentioned, right side chest pain almost always has other causes. Pleurisy is a condition in which the membranes that surround the lungs and line the chest cavity become inflamed. This can cause chest pain or pain in the upper back. The pain is typically worse when you’re breathing in. Pleurisy is usually caused by a viral infection, but it can also be caused by tuberculosis, congestive heart failure, cancer, pulmonary embolism and certain collagen vascular diseases. Pneumonia is a lung infection that can occur in either one or both of your lungs. It can be caused by a bacterial infection or a viral infection and is the most common cause of hospitalizations in the U.S. after childbirth. Children and older adults have a greater risk of developing pneumonia, and are more likely to die from it if they do get it. Besides pain in your chest, other symptoms of pneumonia include fever and chills, nausea and/or vomiting, chest congestion and breathing difficulty. Heartburn and acid reflux often go hand in hand. That burning sensation you sometimes feel in your chest after you eat, or when you bend over or are in bed at night. Heartburn is usually a symptom of acid reflux. That’s when stomach acids come up into your esophagus. Acid reflux that occurs more than twice a week is called gastroesophageal reflux disease, or GERD. While over-the-counter medications can temporarily relieve the symptoms, they aren’t a long-term solution. Weight loss and a proper diet can often clear up the majority of acid reflux cases. Also, sitting up straight after eating usually helps minimize symptoms too. Extreme stress and anxiety can sometimes trigger panic attacks. And if you’ve ever had a panic attack, you know it can feel like you are having a heart attack! When a panic attacks start, you begin to hyperventilate, or take short, shallow breaths. You have muscle spasms in your chest, which can cause chest pain. Heart attack pain typically occurs in the left side of the chest, but because the symptoms of a panic attack can mimic those of a heart attack, it’s best to seek medical attention just to be on the safe side. Whether it’s a car accident or a bad fall, blunt trauma to the chest can obviously lead to chest pain. Injuries that can cause severe chest pain include rib fractures and a collapsed lung or lungs. While many chest injuries will heal on their own, it’s worthwhile getting them checked out by a medical professional. This is a specific type of high blood pressure that affects the arteries in your lungs and the right side of your heart. It can make your heart work harder, causing chest pain. A pulmonary embolism is a medical emergency that must be treated by a medical professional as soon as possible. It occurs when a blood clot travels to your lungs from a vein in your leg. It stops blood from getting to your lung tissue, which causes chest pain. if you have a pulmonary embolism, you may also experience pain that radiates to your arm, shoulder, jaw and neck. Muscle strains are damage or tears to the muscle fibers when they’ve been abnormally stretched. It can be the result of repetitive movements or overuse from everyday activities like lifting a heavy object or playing a sport. Repeated overuse of some muscles can cause what’s known as muscle imbalances. Although they can cause a significant amount of pain, muscle strains are not dangerous and can be treated right at home. These conditions include rounded shoulders, hunchback posture and forward head posture. Postural dysfunctions cause your muscles, joints and ligaments to function under increased stress and strain. And this leads to pain. Check out this article to learn how to improve your posture in 17 easy steps. The root cause of postural dysfunctions — and any pain associated with them — is muscle imbalances. The best and easiest way to identify and fix your muscle imbalances is with Muscle Balance Therapy, an integral part of my Lose the Back Pain® System. Thank you for your informative article about Back Chest Pain Right Side. I suffer from the above mentioned pain, by reading your post I got all my answers.